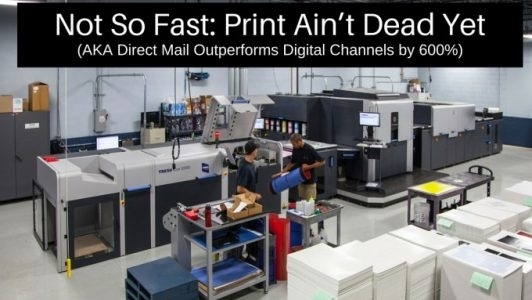 If you’re having trouble tracking the results of your direct mail campaign, then perhaps you’re unaware of the variety of solutions that are available to make print measurable. The good news is multi-channel marketing automation software (like MindFire and others) can help. If you’re not using a platform to track your mail and generate more leads, you’re most likely leaving money on the table. Why? What if it’s also true that because there is less competition in the mailbox for your prospects’ attention, your message may get more easily in front of your prospect? Combine this thought with something else the DMA has reported: direct mail response rates, over the past 2 years, are rising. So, not only are you competing against fewer people for your prospect’s attention, but response rates are also moving in your favor — meaning, you’re more likely to generate leads. Take your direct mail knowledge one step further. The Economist recently analyzed the future of print in the United States, and we compiled the most helful data points into an eBook. Get insights to help you create more leads, learn about areas of growth, and see what the experts forecast will happen over the next few years.